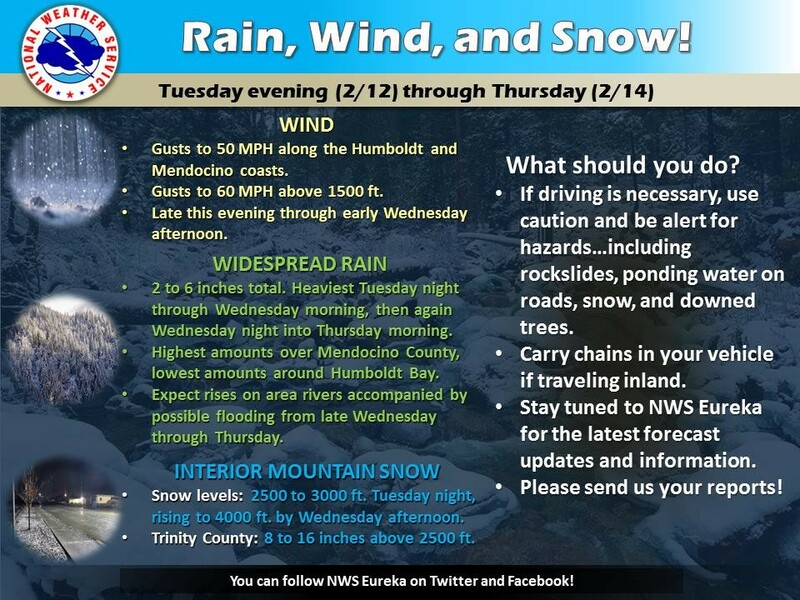 The Eureka office of the National Weather Service has issued a wind advisory for the Humboldt and Mendocino coasts from 8 p.m. Tuesday to 3 p.m. Wednesday as another storm system rolls through the region bringing "heavy rain, gusty winds, and mountain snow." Flood watches are also in effect for Southern Humboldt and Mendocino County starting late tonight and continuing through Thursday afternoon and for the Eel River at Fernbridge. The heaviest rain is forecast for tonight into Wednesday with moderate levels continuing into Thursday, which is expected to cause “rapid rises” on area rivers with some expected to reach monitor or flood stage, according to the Eureka office of the National Weather Service. 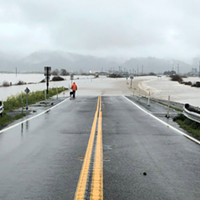 The Humboldt County Office of Emergency Services reports that the Eel River is forecast to reach flood stage at Fernbridge late Thursday afternoon, but the information will continue to change over the next 24 to 48 hours. Tuesday evening update: A series of storm systems will bring a wide range of active weather to the region over the next several days. This will include heavy rain, gusty winds, and mountain snow. *A Wind Advisory is in effect for the Humboldt and Mendocino coasts as well locations above 1500 feet from 8PM this evening through 3PM Wednesday. *Winter Storm Warnings remain in effect for portions of Trinity County above 2500 feet through Wednesday afternoon. *Moderate to heavy rain is expected to cause rapid rises on area rivers and streams by Wednesday. A Flood Watch is in effect for Mendocino and southern Humboldt Counties from late tonight through Thursday afternoon. Please use caution if planning to travel over the next few days, and make sure to monitor road conditions. 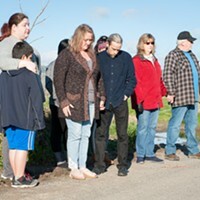 This forecast is broad and includes a large and diverse area covering all of Northwest California, and conditions will vary widely depending on your specific location. For more details, please check the forecast for your specific location at www.weather.gov/eureka. Moderate to heavy rain will spread across the region this evening through Thursday night. Rainfall totals from 2 to 6 inches will cause rapid rises on the Eel River at Fernbridge. Stay tuned to developments by listening to NOAA Weather Radio or your local TV or radio stations. rising water levels and be prepared for possible flood warnings. The next statement will be issued around 10 AM Wednesday morning or as warranted by changing conditions.